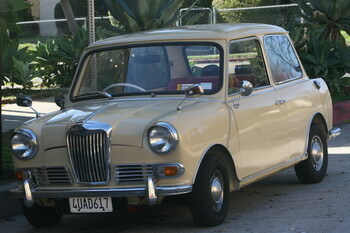 This is a Riley Elf MK III, a variation of the Mini. These cars were only build for four years (1965 – 1969), the total output was 30.000 cars and today only 800 are believed to be still around. And one of them lives right here in the neighborhood. Fantastic! Truly cute… but I wonder how fuel-efficient is is.